As you can see in the first graph there is a large disparity between average home values in metropolitan areas. The San Jose metro area rises far above the rest of the country with an average home value of $1,007,400. San Jose’s title as “the Capital of Silicon Valley” is the main reason for the mind-boggling average home value. 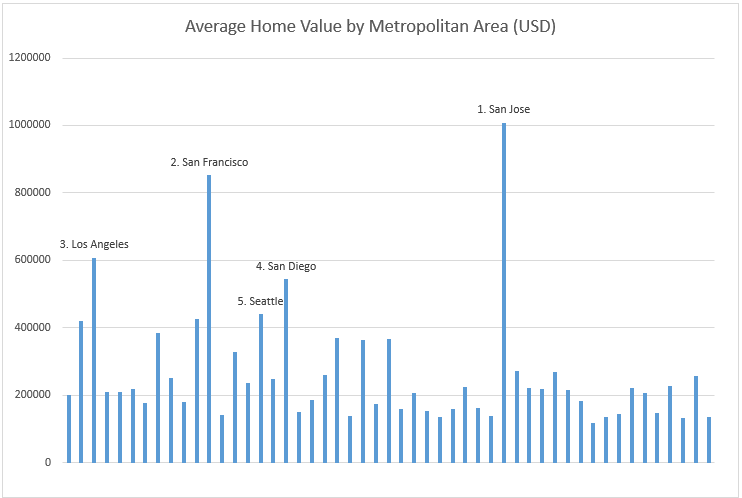 Another Bay Area city ranked second in terms of highest average home value; the San Francisco metro area had an average home value of $851,900. 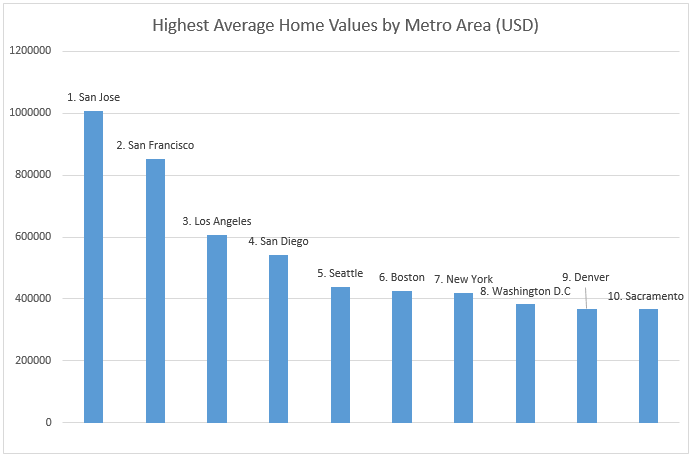 Outside of the Bay Area, California continued to have the highest home values. Los Angeles came in third with an average home value of $606,500 followed by San Diego at $543,300. Only one metropolitan area outside of the state of California ranked in the top 5, with Seattle at $440,100. After the Emerald City area, there were three east coast cities: Boston, New York, and Washington D.C. with home values at 425, 419, and 383 thousand dollars respectively. Denver and Sacramento closed out the top ten. Both metro areas had average home values just above $365,000. In total, seven of the ten metropolitan areas with the highest average home value are west of the Mississippi River. Among top 50 metro areas, the lowest home values are in Memphis. At an average price index of $118,800, homes in the Memphis area are 88% cheaper on average than those in the San Jose area. 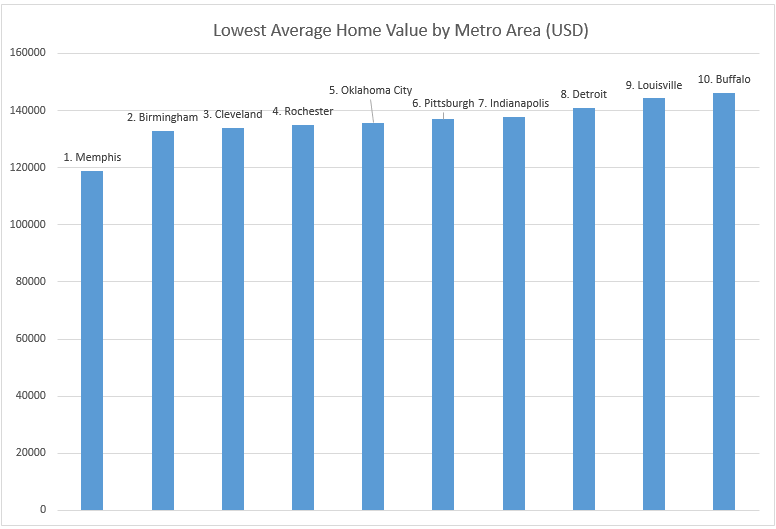 Another southern city, Birmingham, ranked 2nd in terms of lowest average home value at $132,800. Following Memphis and Birmingham was Cleveland. 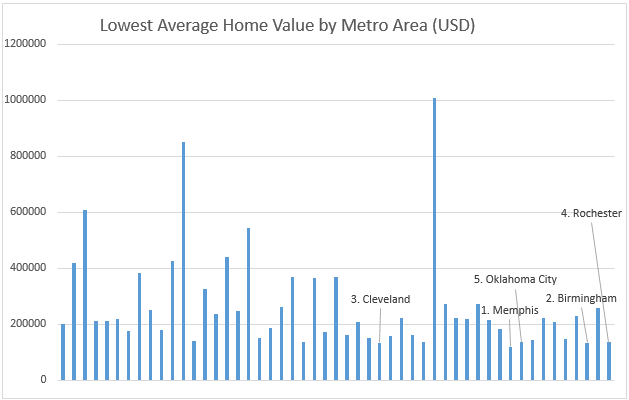 The Cleveland metro area had an average home value of $134,000. Rochester, New York’s metro area ranked fourth in terms of lowest average home value at $135,100. The Oklahoma City metro area featured average prices just barely higher than Rochester at $135,700. The theme of cities located away from coastal areas continued in the rest of the top ten. Pittsburgh’s metro area had the sixth lowest average home value at $136,900. Indianapolis, Detroit, and Louisville followed Pittsburgh; the three Midwestern metro areas maintained average home values of 137, 140, and 144 thousand dollars respectively. The Buffalo metro area ranked tenth in average home value at $146,300. In general, home values have rebounded since the crisis in the mid-2000s. As expected, owning a home in or near a major city can come at a high cost. However, some metropolitan areas maintain much higher average home values than others. Similarly to rent inside city limits, home values within and surrounding California cities are higher than the rest of the country. Areas surrounding Northeastern cities also tended to have higher home values than those in the Midwest or the South. While buyers often associate higher home values with a nicer area, less popular markets can lead to better value. Whether you’re moving to a city or suburb, knowing the average home value in your metro area can help you make an informed decision.